The two patients enter the hospital medical scanning unit hoping for opposite outcomes. Vanessa Q., who has suffered several early pregnancy losses, hopes that an ultrasound exam will reveal a viable embryo in her still-flat abdomen. Michael P., a sixteen-year-old who has excruciating headaches, is to undergo a magnetic resonance imaging (MRI) scan to assure his physician (and himself!) 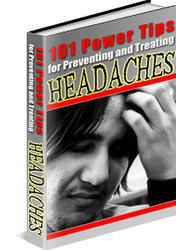 that the cause of the headache is not a brain tumor. 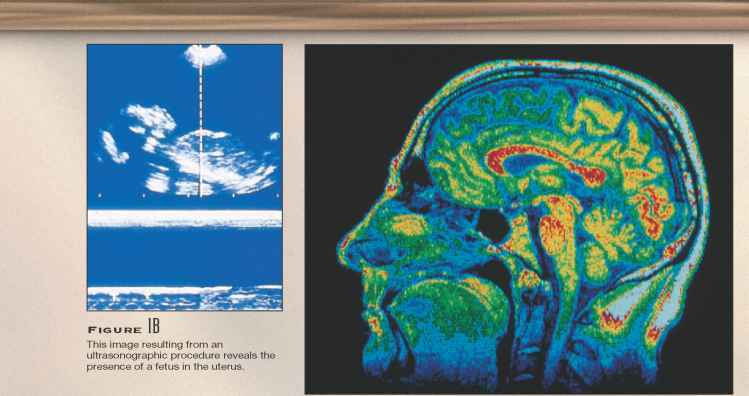 Both ultrasound and magnetic resonance imaging scans are nonin-vasive procedures that provide images of soft internal structures. Ultrasonography uses high-frequency sound waves that are beyond the range of human hearing. A technician gently presses a device called a transducer, which emits sound waves, against the skin and moves it slowly over the surface of the area being examined, which in this case is Vanessa's abdomen (fig. 1A). Prior to the exam, Vanessa drank several glasses of water. Her filled bladder will intensify the contrast between her uterus (and its contents) and nearby organs because as the sound waves from the transducer travel into the body, some of the waves reflect back to the transducer when they reach a border between structures of slightly different densities. Other sound waves continue into deeper tissues, and some of them are reflected back by still other interfaces. As the reflected sound waves reach the transducer, they are converted into electrical impulses that are amplified and used to create a sectional image of the body's internal structure on a viewing screen. This image is known as a sonogram (fig. 1B). Glancing at the screen, Vanessa yelps in joy. The image looks only like a fuzzy lima bean with a pulsating blip in the middle, but she knows it is the image of an embryo — and its heart is beating! 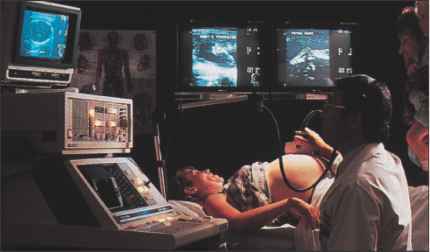 Ultrasonography uses reflected sound waves to visualize internal body structures. The human organism is a complex structure composed of many parts. The major features of the human body include cavities, various types of membranes, and organ systems. Falsely colored MRI of a human head and brain (sagittal section). that provides contrast so that a radiologist examining the scan can distinguish certain brain structures. Then, a nurse wheels the narrow bed on which Michael lies into a chamber surrounded by a powerful magnet and a special radio antenna. The chamber, which looks like a metal doughnut, is the MRI instrument. As Michael settles back and closes his eyes, a technician activates the device. The magnet generates a magnetic field that alters the alignment and spin of certain types of atoms within Michael's brain. At the same time, a second rotating magnetic field causes particular types of atoms (such as the hydrogen atoms in body fluids and organic compounds) to release weak radio waves with characteristic frequencies. The nearby antenna receives and amplifies the radio waves, which are then processed by a computer. Within a few minutes, the computer generates a sectional image based on the locations and concentrations of the atoms being studied (fig. 1C). The device continues to pro duce data, painting portraits of Michael's brain in the transverse, coronal, and sagittal sections. viscera. The dorsal cavity can be subdivided into two parts—the cranial cavity, which houses the brain, and the vertebral canal (spinal cavity), which contains the spinal cord and is surrounded by sections of the backbone (vertebrae). The ventral cavity consists of a thoracic (tho-rascik) cavity and an abdominopelvic cavity. Figure 1.7 shows these major body cavities. are the lungs and a region between the lungs, called the mediastinum. The mediastinum separates the thorax into two compartments that contain the right and left lungs. The remaining thoracic viscera—heart, esophagus, trachea, and thymus gland—are within the mediastinum. The abdominopelvic cavity, which includes an upper abdominal portion and a lower pelvic portion, extends from the diaphragm to the floor of the pelvis. Its wall primarily consists of skin, skeletal muscles, and bones. The viscera within the abdominal cavity include the stomach, liver, spleen, gallbladder, and the small and large intestines. The pelvic cavity is the portion of the ab-dominopelvic cavity enclosed by the pelvic bones. It contains the terminal end of the large intestine, the urinary bladder, and the internal reproductive organs. 1. Oral cavity, containing the teeth and tongue. 2. Nasal cavity, located within the nose and divided into right and left portions by a nasal septum. Several air-filled sinuses are connected to the nasal cavity. 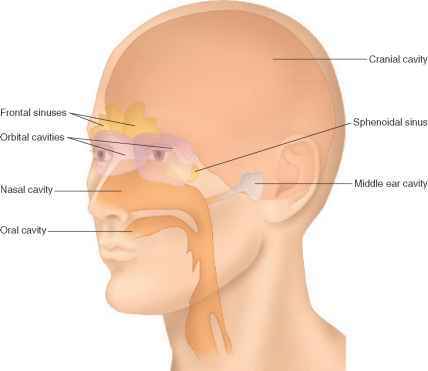 These include the sphenoidal and frontal sinuses (see fig. 7.27). 3. OJrbital cavities, containing the eyes and associated skeletal muscles and nerves. 4. Middle ear cavities, containing the middle ear bones. Thin serous membranes line the walls of the thoracic and abdominal cavities and fold back to cover the organs within these cavities. These membranes secrete a slippery serous fluid that separates the layer lining the wall (parietal layer) from the layer covering the organ (visceral (viscer-al) layer). For example, the right and left thoracic compartments, which contain the lungs, are lined with a serous membrane called the parietal pleura. This membrane folds back to cover the lungs, thus forming the visceral pleura. A thin film of serous fluid separates the parietal and visceral pleural membranes. Although there is normally no actual space between these two membranes, the potential space between them is called the pleural (plooial) cavity. The heart, which is located in the broadest portion of the mediastinum, is surrounded by pericardial (per9ï-karcde-al) membranes. A thin visceral pericardium (epicardium) covers the heart's surface and is separated from the parietal pericardium by a small amount of serous fluid. The potential space between these membranes is called the pericardial cavity. The parietal pericardium is covered by a much thicker third layer, the fibrous pericardium. Figure 1.9 shows the membranes associated with the heart and lungs. In the abdominopelvic cavity, the membranes are called peritoneal (per3-I-to-necal) membranes. A parietal peritoneum lines the wall, and a visceral peritoneum covers each organ in the abdominal cavity. The potential space between these membranes is called the peritoneal cavity (fig. 1.10). O What does visceral mean? Which organs occupy the dorsal cavity? The ventral cavity? Name the cavities of the head. Describe the membranes associated with the thoracic and abdominopelvic cavities. Distinguish between the parietal and visceral peritoneum. Major body cavities. (a) Lateral view. (b) Coronal view. The cavities within the head include the cranial, oral, nasal, orbital, and middle ear cavities, as well as several sinuses. maintenance of homeostasis depends on the coordination of organ systems. A figure called "InnerConnec-tions" at the end of certain chapters ties together the ways in which organ systems interact. As you read about each organ system, you may want to consult the illustrations of the human torso in reference plates 1-7 and locate some of the features listed in the descriptions. Which organs occupy the ventral cavity?